Acnes, pimples, zits, breakouts - all are words that bring visions of blemishes on your skin. However hard you try to avoid skin troubles, these conditions affect everyone from time to time, even those with healthy, glowing skin. Comedonal acnes commonly affect teens, but can also appear in adults. Comedonal acne includes the blackheads and whiteheads typically caused by blocked skin pores. They constitute a mild, early stage of more severe forms of acne. In comedonal acne, the affected area has a lot of whiteheads and blackheads. Comedones occur when skin pores get blocked. The body produces a natural oil called sebum, which in normal quantity keeps your skin healthy and supple. However, hormonal imbalances that occur during puberty, pregnancy, and also when you take hormone control medications can trigger an increase in sebum production. This excessive amount of sebum then accumulates in skin pores. Usually, the sebum flows out naturally on to your skin and so there is no problem. However, when a lot of sebum collects in pores, hair follicles and dead skin cells and dirt can partially or fully block the pores. This results in bumps and lesions on the skin, called comedones. Blackheads: These are labeled as open comedones. When the blocked pores are not fully closed, the exposure to air oxidises the sebum which becomes darker and hardens. These spots are called blackheads. Whiteheads: These occur when the clogged pores are covered by a thin layer of skin. As the pores are not exposed directly to the air, the clogged pores do not become discolored. However, the sebum and other debris that collect in these pores slightly pushes up the skin, forming skin colored bumps, called whiteheads. Considering other skin conditions, comedonal acne is actually a mild beast, but you need to tame this condition before it gets out of hand. If left untreated, this form of acne could turn into inflamed acne breakouts. While acne can affect people with different skin types, it's generally oily skin that is easily vulnerable to breakouts. This is because oily skin normally produces a lot of sebum and even a small spike in sebum levels can cause clogged pores and comedones. ● Wash your face twice a day and use moisturisers and sunscreens appropriate for your skin type. When you have acne issues, avoid using oil or creamy skin care products. Instead, use light texture products that do not leave an oily coating on your skin. ● To treat comedones, consult your doctor. There are over the counter products available, but you should make sure you choose solutions that will not cause allergies or aggravate the acne. Initial topical treatment could include ingredients like salicylic acid, retinoids, benzoyl peroxide etc. This will help clear the dirt and sebum and unblock the pores. ● If the topical applications are not effective, your doctor may suggest prescription medications that include medicine to control sebum production and antibiotics to control infection. ● When taking these treatments, it is even more important to protect your skin with sunscreen. Topical applications for acne and prescription medications may make your skin more sensitive, easily affected by sunlight, heat and dust. Mostly, comedonal acne will respond quickly to topical treatment if caught early, and more severe cases will respond well to medications prescribed by your doctor. However, do not expect to see results overnight, the blemishes may take some time to disappear and the medicines will take some time to bring the excess sebum production under control. If you are looking for a topical application for comedonal acne and reduce acne marks/pimple marks, this product from Kaya is a good option. It is a lightweight water based formulation that is fast acting. It helps unclog pores and get rid of the blackheads, whiteheads and pimples quickly. This serum has been researched and formulated by dermatologists. It contains botanicals like chamomile, kudzu, and burdock that can help get rid of the bacteria causing the infection, preventing your mild acne from becoming a severe breakout. When you see whiteheads and blackheads, you should start treatment at once, to prevent the comedonal acne from becoming a further complicated condition. Use good topical applications, take prescription medications if needed and take preventive measures to stop the acne from getting infected. 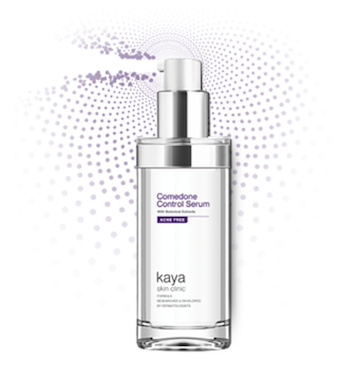 Search for the best cream for pimples or light topicals that control the acne and gradually cure it, like Kaya Comedone Control Serum.